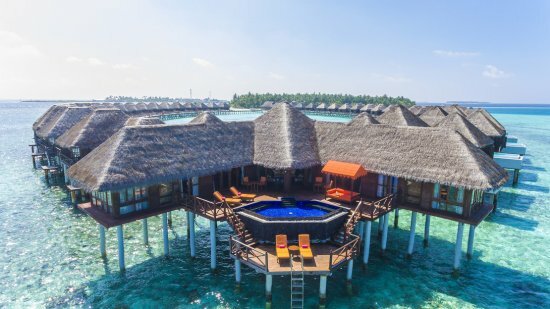 Embrace nature and beauty at this mesmerising island hotspot, Sun Aqua Vilu Reef Resort where turquoise lagoons lead onto the glistening Indian Ocean creating a backdrop to your private island holidaying in complete luxury. Walking barefoot in soft white sand is enhanced by many resort offerings such as private spa pampering, blissful experiences and fine dining, island-style plus luxurious villa retreats welcoming families and couples. Water sports and entertainment, activities geared to families with children and a fantastic kids' club to complement, Sun Aqua Vilu Ref is the perfect holiday retreat for Maldivian fun in the sun. From diving and snorkelling, spa decadence and quietly relaxing indulgence to nights on the dance floor, films under the stars, and open-air bars with the beat of beru beru drums, Sun Aqua Vilu Reef assures guests of a fabulous break! 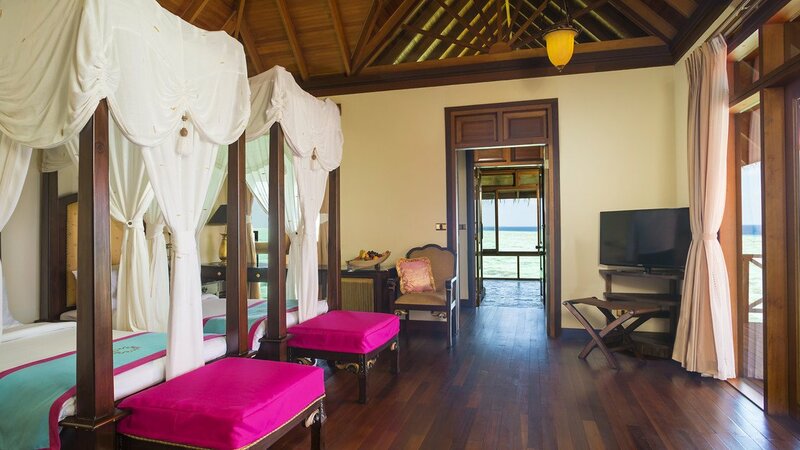 Sun Aqua Vilu Reef is a 45-minute seaplane journey away from Malé International Airport. 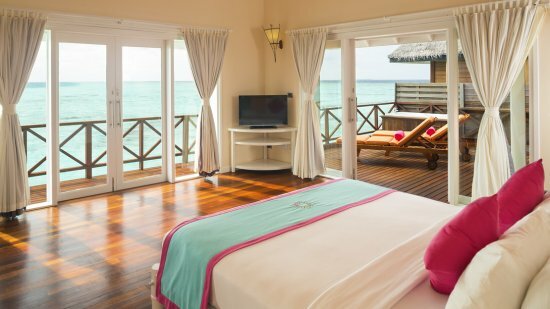 From the direct beach access and private deck of the Deluxe Beach Villas to the romance and swagger of the Jacuzzi Deluxe Villas, these are something special unique to Sun Aqua Vilu Reef. Vibrancy and a tropical theme is laced throughout. A luxurious private pool spanning 30 square metres is an additional feature of this category. Relaxation is easy with beach access also at your feet. 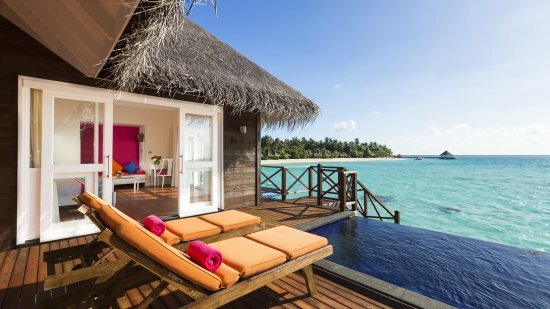 The Sun Aqua Pool Villas offer direct beach access from these signature residences along with a Maldivian swing that's perfect for relaxation and capturing the gorgeous sunsets as you quietly soak up the ambience drifting gently to and fro. 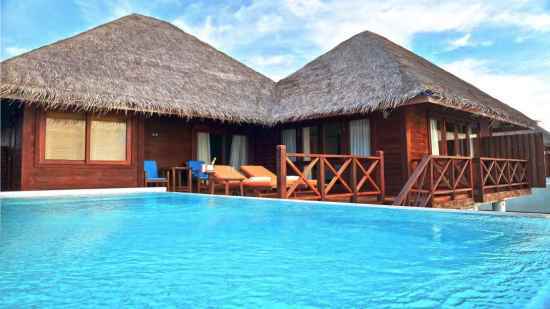 Poised over the turquoise lagoon, these fabulous reef villas epitomise all that is luxury here at Sun Aqua Vilu Reef. 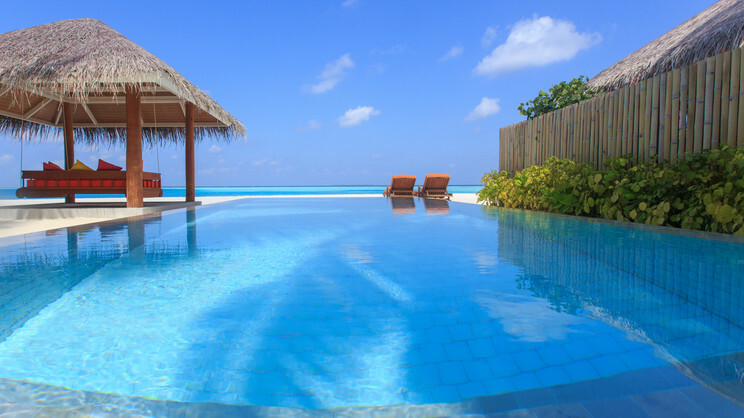 A fabulous break away from it all, this is Maldives holidaying at its finest. A private lagoon jetty and personal sundeck, Jet tub, and chaise longue will ensure the best views and access to the coral and marine life in this mesmerising part of the world. 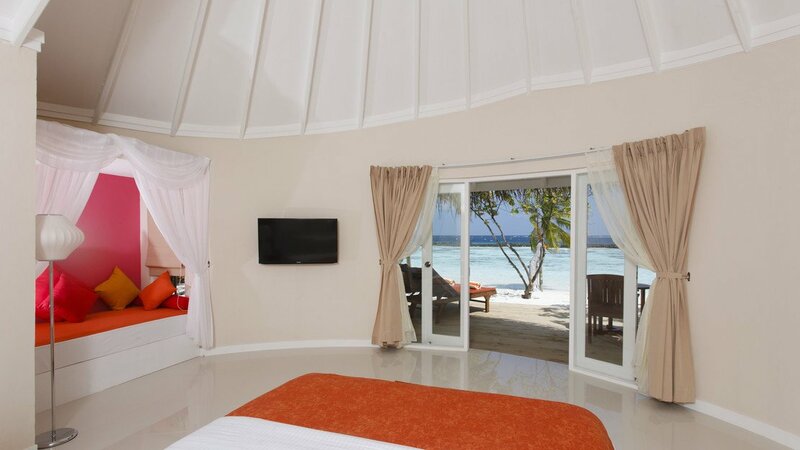 For the most idyllic views of the glorious sunsets, opt for the Sunset Reef Villas. Beautifully stylish and tranquil, the 6 Aqua Villas bring the marine beauty to life on a luxurious scale. A freestanding tub, oversized shower and daybed in addition to a dedicated dressing area will ensure the interior design more than caters for your needs. Outside and, well, paradise. Night time brings a new sense of harmony as you soak in the plunge pool beneath twinkling stars or quietly swing in the hammock watching the sun go down. 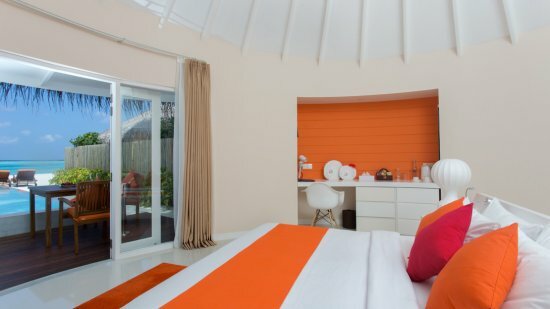 The soft and airy furnishings blend well with the pristine finish of these decadent villas. Formerly known as Harmony Water Villas, these are the perfect for choice for lovers. A spacious deck and oversized canopy bed provide the romantic edge and with a 30 square-metre infinity pool dedicated to this suite, guests will feel truly privileged. If families require these suites then the living area can double up as a second bedroom for the children whilst still retaining a level of privacy for the parents. 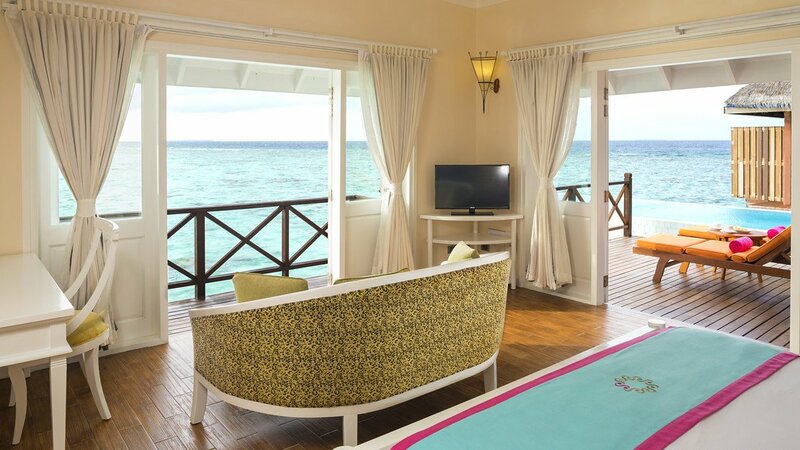 The essence of Sun Aqua Vilu luxury has to be the Grand Reef Suite. With a fully functional kitchenette and separate lounge, the space here is immense. A wraparound terrace ensures you get the best views from sunrise to sunset and there are two bedrooms for added privacy amongst guests. An infinity pool is a beautiful addition to the outside space and the Maldivian signature craft pieces reference this truly amazing location. A fabulous array of dining experiences awaits each guest at Sun Aqua Vilu Reef, from romantic private dining on a secluded beach to a feast of grilled seafood in 'The Well Done', this is a treat for all ages and one to be savoured! Beginning with breakfast, The Aqua is perfectly poised for guests to start the day in style over lagoon waters. Warm bakery delights and fresh juices combine with Maldivian dihes and Western classics. This venue is open for lunch and dinner too. Popular with all guests, enjoy the pineapple and tomato topped pizzas along with other mouth-watering combinations of sauces and ingredients. Dine with your feet caressing the soft sands, enjoy a specially chosen wine from the glass-enclosed wine cellar and dine on the freshest seafood and succulent grilled delights. As evening draws in, the ambience is blissfully tranquil and oozes romance! Cool cocktails, ice-cold mocktails and tropical shakes are amongst the many drink on the bar menu here beside the pool. Guests can even have their snacks and drinks brought right t their loungers. From in-villa privacy to secluded beach experiences, this is a wonderful options for celebratory couples or parents after some quiet time once the children are settled with the resort's babysitter. The Sun Aqua Vilu Reef all-inclusive programme ends at 2pm on the day of your departure. Details may be subject to change. You will be provided with full details of the all-inclusive programme on arrival at the hotel.